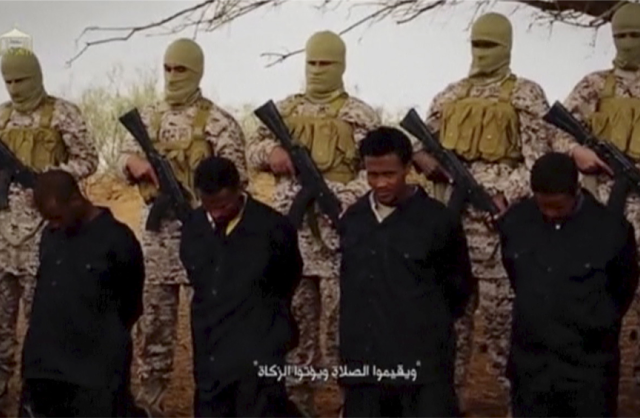 Ethiopia has confirmed that 30 of its nationals were killed by Islamic State militants in Libya. The confirmation came Monday, a day after the Islamic State group released a graphic video purporting to show Ethiopian Christians being decapitated or shot in the back of the head. An Ethiopian government statement condemned what it called the “inhuman mass murder of its citizens.” The government declared three days of mourning Monday which will start Tuesday, when lawmakers will meet to discuss the killings and consider the country’s possible response, the government said in a statement. The national flag also will fly at half-staff during the days of mourning. The 29-minute video, released on Sunday via social media accounts and websites is similar to one released in February showing militants cutting off the heads of Egyptian Christians. Redwan Hussein, an Ethiopian government spokesman, said on Sunday that he believed the victims were Ethiopian migrants trying to reach Europe. The White House has condemned “in the strongest terms” the mass murder. “That these terrorists killed these men solely because of their faith lays bare the terrorists’ vicious senseless brutality,” a spokeswoman said Sunday, adding that the killings show the urgent need for a political settlement to the chaos in Libya, and a unified rejection of terrorist groups. Ethiopia long has drawn the anger of Islamic extremists over its military’s attacks on neighboring Somalia, whose population is almost entirely Muslim. While a militant in the video at one point said, “Muslim blood that was shed under the hands of your religion is not cheap,” it did not specifically mention the Ethiopian government’s actions. An Arab League official told the French news agency military chiefs from the region would meet in Cairo this week to discuss creating a joint force against the Islamic State group. The United States already is leading an international coalition carrying out airstrkes against Islamic State targets in Syria and Iraq, allowing Iraqi forces to seize back areas from the militants.